Kansas Wesleyan’s Jake Olofson (JR/Livermore, Calif.) was named as the KCAC Baseball Pitcher of the Week. He was selected for his performances from April 1-7 by a vote of conference sports information directors. Olofson was outstanding on the bump for the Coyotes to cap a doubleheader with No. 12 Oklahoma Wesleyan on Sunday. 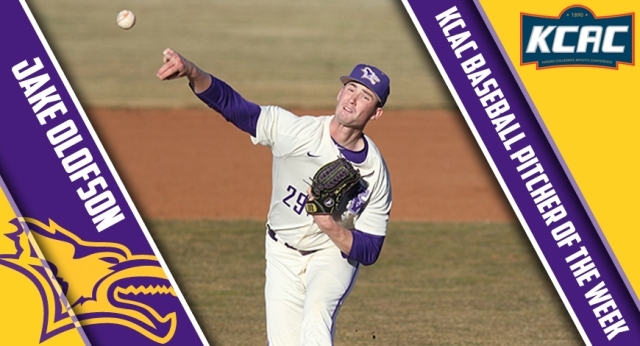 Olofson went 6 and a third innings, scattering three hits and struck out eight as he got the win over the Eagles giving KWU a doubleheader sweep. Olofson’s performance was big as KWU handed OKWU its first shutout loss of the season in the 2-0 decision. The win in Sunday’s nightcap pushed KWU’s record to 17-15 overall and 11-10 in the KCAC. The Coyotes fell to Oklahoma Wesleyan in the series finale on Monday. Wesleyan is back in action on Wednesday, hosting the McPherson College Bulldogs in a make-up of a game originally scheduled for February 14. First pitch Wednesday is scheduled for 6 p.m.